Nothing in the House: Happy Birthday (Pie), Grant! For my brother's 21st birthday I made him a fresh cherry pie. I also gave him a bottle of Maredsous beer, which is brewed at the monastery in Belgium where my grandma's cousin Renee is a monk--it was Grant's 21st, after all, and being his older sister, I felt obliged to supply him with some sort of booze). I used fresh Michigan cherries--part Rainer (the yellow variety) and part Bing (the stains-your-hands-deep-red variety). I had hoped to use sour cherries because they seem to make better and more flavorful pies, but they didn't have any at the local Elkhart, Indiana grocery store. 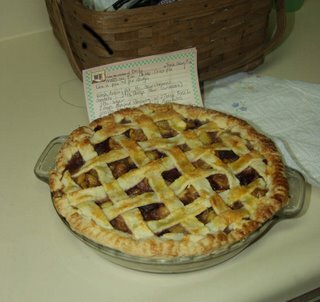 I used the recipe from my mom's old "Joy of Cooking"(not sure what year). It called for tapioca, but I substituted it for flour because I didn't want it to have that gelatin-like consistency that many cherry pies seem to have. I used my standard crust recipe, though we didn't have whole wheat pastry flour, so I just went with all-purpose. Thanks to mom for sacrificing her hand's skin tone by cutting the pits out of the cherries (we couldn't find our pitter). To do the lattice top (a signature mark of cherry pie!) I cut a template out of cardboard so that each strip of dough would be approximately the same width. It was my first independent-attempt at lattice top and I was pleased with how it turned out. We topped it with DQ soft serve. 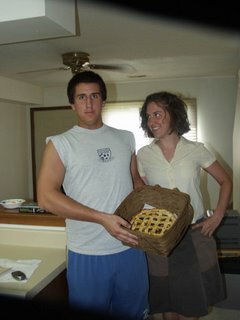 Don't know if there are pics of us in the pie enjoyment zone, though. I do not think we took photos in the pie enjoyment zone. C'est la vie.